The curators of the Hungarian Pavilion of the 14th International Architecture Biennale present their ideas with the title BUILDING. They wish to present an educational model called The Carpathian Basin Method, which is intimately connected with one of the main themes of the show, the community- and personality-shaping capacity of building, and its influence on the built environment. A key element of this project is the demonstrative BUILDING that takes place in the central atrium. The photo exhibition of the ethnographer and photo artist László Kunkovács, entitled Primal Buildings, is presented within this context. These works focus on the communal building projects (kalákas) of the Hungarian education of architects and landscape architects, as well as the works received for the building competition entitled „GATE to the Reception Area”. Following the line of thought of the 2010 BorderLINE Architecture and 2012 SpaceMaker exhibitions, the curators present the unique building practice of the Carpathian Basin together with its implications. One of the key elements of this project is the designing and demonstrative building of the „GATE to the Reception Area”, which may enhance a reconsideration of some of the fundamental issues of building. The exhibition of László Kunkovács presents the buildings of spontaneous (anonymous) construction processes that still survive in Hungary. These structures, which can also be considered to be models of the universe, were the reference points of the building processes that started three decades ago. These are shown in the second part of the exhibition. These are the buildings that the curators call the Carpathian Basin Model. These actions give professional answers to real questions, they make these communities better and more demanding. They help future architects develop empathy, an active interpretation of reality, and the recognition of the sacral aspects of architecture, but – by involving children too – they also take part in the education of the youngest generation. 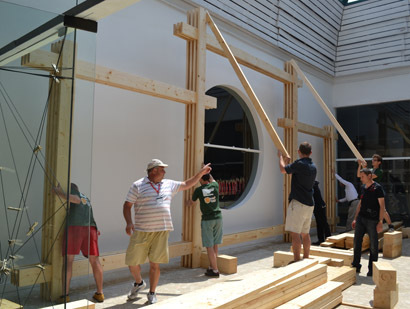 The demonstrative construction of the winning work of the „GATE to the Reception Area” competition, together with the accompanying exhibition, lead to the reconsideration of the fundamental issues of building, and also answers the main question of the head curator. BUILDING – 14th Architecture Exhibition La Biennale di Venezia – Hungarian Pavilion 2014 | The community- and personality-shaping capacity of building, and its influence on the built environment.